Beauty and the Beast (film) The beautiful Belle ignores her suitor, the vain Gaston, as she cares for her father, the eccentric Maurice. When Maurice stumbles upon a foreboding castle while lost in the woods, the servants, enchanted into household objects, try to make him welcome, but he is thrown into the dungeon by the Beast. Belle comes to rescue her father and agrees to remain in the castle as his substitute. In order to break the spell, Beast must learn to love another and to be loved in return. 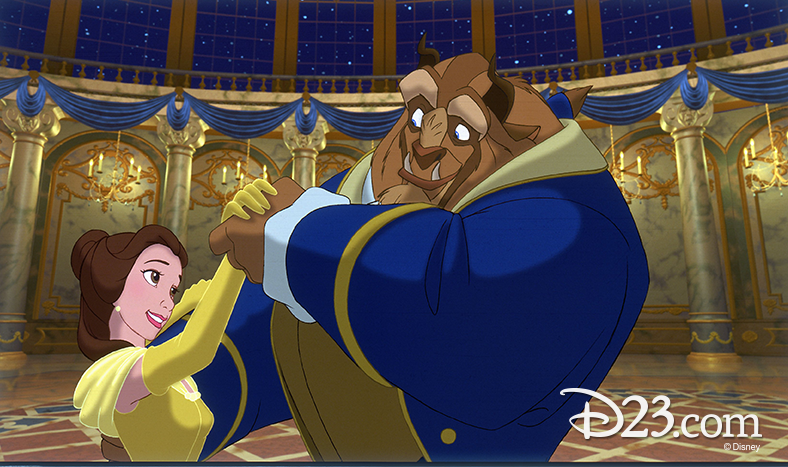 Belle seems a likely candidate, but it takes Beast a while to reign in his temper. Belle desperately misses her father, so Beast sadly allows her to leave. Gaston, realizing Beast is a rival for Belle’s affection, leads the townsfolk to storm the castle. Belle rushes back in time to profess her love for Beast, and the spell is broken. Initial release in New York on November 13, 1991; general release on November 22, 1991. Directed by Gary Trousdale and Kirk Wise. 84 min. Voices include Paige O’Hara (Belle), Robby Benson (Beast), Richard White (Gaston), Jerry Orbach (Lumiere), David Ogden Stiers (Cogsworth), Angela Lansbury (Mrs. Potts), Jo Ann Worley (Wardrobe). Academy Award nominee in seven categories, including, for the first time for an animated feature, that of Best Picture, it won for Best Song (“Beauty and the Beast” by Howard Ashman and Alan Menken) and Best Original Score. Angela Lansbury sang the title song in the story, and Celine Dion and Peabo Bryson sang another rendition over the film’s end credits. Since lyricist Howard Ashman had died earlier in the year, the film was dedicated to him: “To our friend, Howard, who gave a mermaid her voice and a beast his soul, we will be forever grateful.” Production of the film took three and a half years and required the talents of nearly 600 animators, artists, and technicians. Portions of the film were animated at Disney’s satellite facility at Disney-MGM Studios in Lake Buena Vista, Florida. Art directors working on the film travelled to the Loire valley in France for inspiration, and studied the great French romantic painters such as Fragonard and Boucher. It was Ashman who came up with the idea of turning the enchanted objects into living creatures with unique personalities. Glen Keane, the supervising animator on Beast, created his own hybrid beast by combining the mane of a lion, the beard and head structure of a buffalo, the tusks and nose bridge of a wild boar, the heavily muscled brow of a gorilla, the legs and tail of a wolf, and the big and bulky body of a bear. Computer-generated imagery was used in several parts of the film, most notably in the “Be Our Guest” sequence and in the creation of a striking three-dimensional ballroom background, allowing dramatic camera moves on the animated characters as they danced. It became the most successful animated feature in motion picture history up to that time, with domestic box office revenues in excess of $140 million. Released on video in 1992. The film was reissued in IMAX and other giant screen theaters on January 1, 2002, featuring the song “Human Again” in a never-before-seen animated sequence. New running time 90 min. A 3D version was released on January 13, 2012, on a program with the short Tangled Ever After.